The choice of cylinders is yours, but make sure that they have modular valves fitted to them. Cylinders can still be used with normal valves but it makes life much easier with modular valves fitted. All cylinders have their own characteristics in water, my advice is use what is best for you! If you prefer, drop me a line and we can discuss the advantages and disadvantages of cylinders, from aluminium to steel, from 5ltr to 12ltr up to 232 bar, and you can then decide on your choice. Height position of steel bands and the orientation of the boltsnaps is crucial for accessing your valves and sitting comfortably at the side of you. In the UK, HSE regulations require that CE approval is required on all diving equipment, therefore my choice is but a few. The X-DEEP STEALTH 2.0 TEC and RB (redundant bladder) harness works! Since the birth of the STEALTH 2.0 classic, a revolution in Sidemount diving continues to become stronger and stronger. 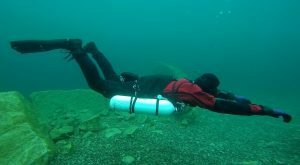 Three years after the classic, X-DEEP decided to make one of the world’s best Sidemount systems even better. As a base they used the outstanding STEALTH 2.0 harness and weight management system so that all STEALTH components could be seamlessly compatible. Side trim weight pouches and rear accessory pouch can be added to suit your needs. STEALTH 2.0 is after all a tried and tested technology and an advanced design. Keeping the perfect streamlining and balance as per the classic, but in a wing that offered additional lift to cope with the demands of deep, multi-cylinder technical dives. The new Apeks WSX 25 released after 3 years of design, it is impressive! Several advisors including myself, have taken the best characteristics from each of the top harnesses and put it into one very practical and uniquely aesthetic looking rig. I’ve been diving this rig rigorously since December 2014, and found it achieved everything I wanted it to do throughout over 1000’s dives in wetsuits, drysuits and using multiple stages on steel Sidemount tins. The bladder is constructed from Armoguard, a super-tough material normally found in public safety diving and military products. This smooth material is ten times more abrasion resistant than standard Cordura (the material used on many other Sidemount harness bladders), making this a wing designed with serious Sidemount diving in mind. Reversible inflator can be mounted on left or right side as can be the dump valve and a centre flush dump valve for the ambidextrous diver. The Apeks “SlideLock” sliding D-ring is brand new and unique to Apeks. 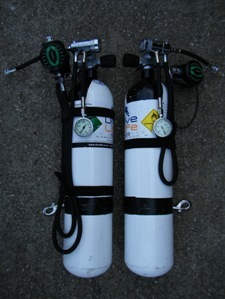 It allows the diver to easily change the position of the cylinders as their buoyancy changes during the dive. No need to clip your ally80 cylinder on and off, simply adjust the position of the D-ring during your dive. For steels it stays locked in position. The flutted bladder also has a lift of 27lb even though it bears the mark of 25 in the logo. The Diamond which was originally based on the Razor harness, is also good system too. 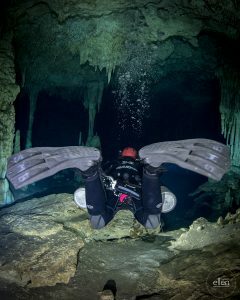 The systems were designed primarily for sidemount cave diving but as every diver should have a horizontal profile, for the purpose anti silting, ultimate relaxation and buoyancy control, this makes it perfect for any diver. Suitable for sidemounting single or twin cylinders and of course stages. 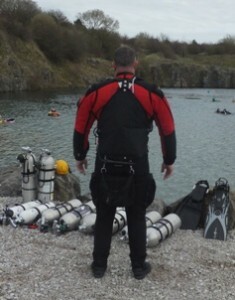 These systems can be used in any environment from open water to cave systems. Full visibility over your breathing equipment. Reduces additional gear: Doubles bands/ Hardware/ Backplate/ Manifold – Benefit when traveling. Transporting gear to and from the beach or boat – one tank at a time if needed. Streamlines profile which in turn reduces drag increasing your bottom time. The Razor 2 harness is also a Sidemount only system, designed purely for the Sidemount diver and is completely integrated! 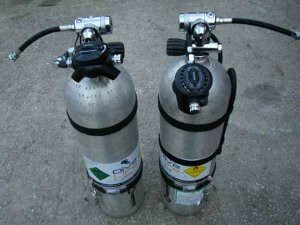 It can be used for both warm and cold water diving, whether using steel or aluminium cylinders. Get it fitted by your instructor, who should have plenty of experience in tailoring and adjustment both on land and underwater, it will save you many hours of ‘trial and error’. If after your Sidemount course you would like me to taylor fit your harness for you, I will be happy to provide my expertise and knowledge. Contact me to book a fitting. Although I have used many makes and models of regulators, I am compelled to say that the best overall reg to use at various depths in waters as cold as 0 degrees very practical for Sidemount is the APEKS XTX 50 DST with 5th port, somewhat perfect for the job and available at your local Apeks dealer. 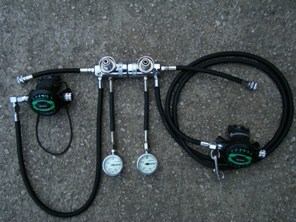 The XTX50 regulator can be converted from a right handed hose configuration (as supplied from the APEKS factory in the standard) to a left handed one. This feature is known as the Reversible Venturi System (RVS). Changing the regulator to a left handed configuration is both quick and simple and can be performed by any APEKS Authorised Service Technician. A new silicone exhaust valve has been used on the XTX50 regulator improving breathing performance. For more information visit Apeks website.